When we think of a doctorate degree, we think of the highest degree attainable in an academic field held by a person who is a subject matter expert. The degree holder imparts knowledge to college students, conducts research, and exemplifies critical thinking. Teaching an honors college class of university freshmen propelled Dennis Conklin, Ph.D., to the secondary classroom. In fact, out of all the classes he taught, his favorite college teaching experience occurred with this particular group. 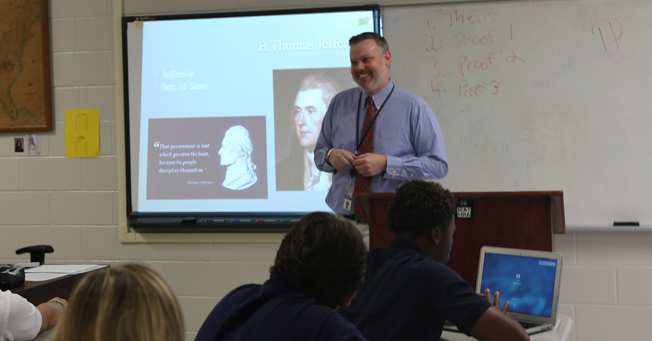 When Dr. Conklin saw an advertisement for an instructor of history at Jackson Academy, he reasoned that juniors and seniors in a college preparatory school were similar to the honors freshmen he was teaching, and he decided to interview. His work at JA is modeled on his college teaching experience. Having taught college freshmen in other classes who were unprepared for higher education, Dr. Conklin is determined to make sure his JA students know what they will encounter. “College is not about memorization. It is about critical thinking. All my essay questions require students to make an argument and prove it. I want to get them ready to thrive in that environment,” he says. Adopting an argument and proving it corresponds well with Dr. Conklin’s other previous career—that of the law. Writing briefs in a big law firm left him unfulfilled, so he returned to college to pursue his love—history—and to teach on the college level. He now teaches four sections of eleventh grade U.S. History, a post Civil War elective, and a debate rotation for eighth graders. He is especially eager to begin the spring semester in which students taking the Civil War elective will create web pages on a topic of interest, such as medicine or ancestry. Dr. Conklin holds both a doctorate and a master’s in history from the University of Southern Mississippi, a Juris Doctor from Loyola University of New Orleans, and a bachelor’s in political science from Blackburn College in Carlinville, Illinois. Katharine Todd, Ph.D., planned on a career in education. “Teaching is my chosen career, and I think it’s the perfect job. It’s wonderful to have a career that offers a fresh start each year. Material might be repeated, but the classroom dynamic is never the same,” she said. Dr. Todd earned a doctorate, a master’s and a bachelor’s degree in English at the University of Mississippi. She taught in the department of English and held administrative roles with the university. Her work experience has included editing narratives for a published work, consulting with students through the university’s writing center, and consulting with students who were preparing to take the Graduate Record Examination (GRE) for admission to graduate school. 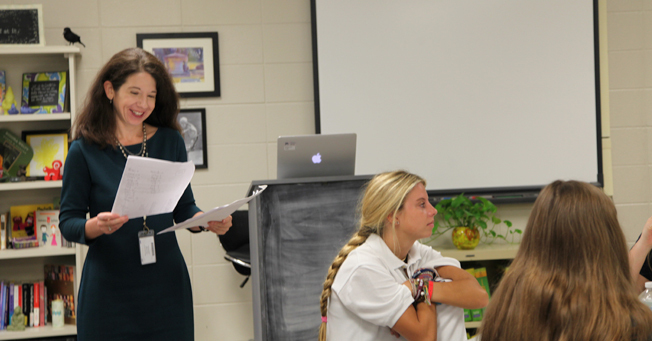 At JA, she teaches British Literature, AP Language and Composition, and creative writing, while advising the staff of the literary magazine, Images. Laura Reynolds Zettler, Ph.D., brings a wealth of college-level teaching experience to her first semester at JA. As she is teaching JA seniors, she applies the economic principle that decisions have tradeoffs. This approach helps students with practical aspects of financial management and career choices. Dr. Zettler holds a doctorate from the University of Missouri and master’s and bachelor’s degrees from the University of Alabama. She served as a full-time faculty member at the University of Alabama and the College at Southwestern Baptist Theological Seminary in Fort Worth. She continues to teach on the college level as an adjunct professor for Mississippi College and as an online professor for the University of Alabama. Her teaching experience includes courses in economics, personal financial planning and management, retirement planning, investments, financial stewardship, risk management, tax planning, estate planning, and business skills for life. “In addition to classroom teaching, I have been involved in various research projects, and have experience working for the U.S. Senate, the Speaker of the House, and the Federal Reserve Board. I love how my field of study applies to such an important part of our everyday lives,” she said. The Zettlers’ children Lily and Claire are JA students.